Join us, Michael Penn II, Emili Earhart and Evan Woodward for a live podcast recording at the High Noon Saloon. 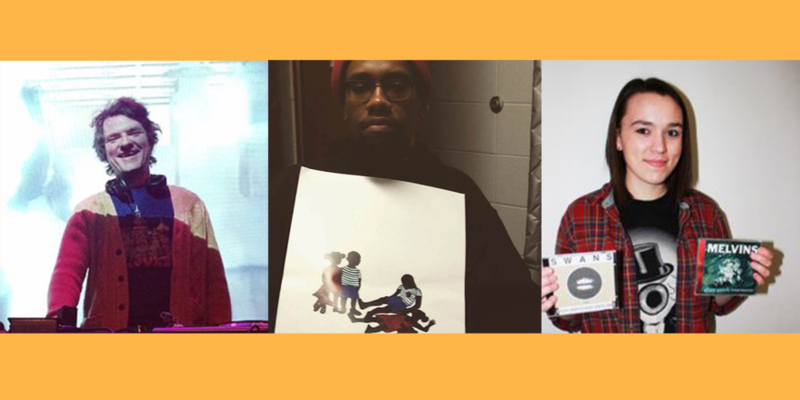 From left to right: Evan Woodward DJing, Michael Penn II (aka CRASHprez) holding the cover art for his latest album, and Emili Earhart holding Swans and Melvins CDs. The Tone Cluster is a new event series in which we take our weekly podcast to the stage of the High Noon Saloon, and it's happening again on Tuesday night from 6 to 8 p.m. We'll be looking back on the year in Madison arts and culture in a discussion with three of the people who helped to make it interesting: WSUM music director Emili Earhart, rapper and journalist Michael Penn II (aka CRASHprez), and versatile DJ and Strictly Discs manager Evan Woodward. The podcast recording is only part of that time—before and after the talk, Woodward will be spinning some of his favorite records released this year. Penn, for his part, keeps telling me that he wants to try and roll out a new track at Tuesday's event, so I'm looking forward to that as well. We'll also make time for audience members to share their comments and ask questions of our panelists. Also, maybe I'll be able to give a preview of my in-the-works annual Madison music roundup. Evan Woodward's frequent DJ sets, at venues including Natt Spil, Mickey's Tavern, and Maduro, reach across a wide spectrum, from warm funk and Caribbean grooves to vast washes of psych and ambient music. Once I saw him play an entire side of a Fripp/Eno record. Check out the guest mix he did for us a couple years back for some idea of his range. He's also largely responsible for stocking a pretty deep/intimidating electronic section at Strictly Discs. Also, he is funny on Facebook. In addition to being WSUM's music director, Emili Earhart also hosts several of the station's music shows, spinning experimental music and booking live-in-studio performances. I mostly know Earhart from her work booking this fall's Snake On The Lake Fest, a WSUM-hosted event that usually has a decent if middling grab bag of a lineup. But this time Earhart took it in a bolder direction, with a compelling and musically diverse lineup of Madison-based acts. Michael Penn II recently graduated from UW-Madison's First Wave program and School of Journalism and Mass Communication. This year he released his first full-length album as CRASHprez, More Perfect, and landed a bunch of shows, including an opening slot for Vince Staples on December 11. His published writing work this year has included powerful essays on the Tony Robinson and Michael Brown shootings, and his Twitter offers a pretty good window into his voracious, earnest, incisive, racing, and all-over-the-place mind. So these three, with some nudging and prodding from me, will be getting all over the place and I'm looking forward to hearing what they have to say. Hope to see you there, and if you can't make it, you can hear the whole thing later this week and some excerpts on the Thursday edition of WORT-FM's In Our Backyard.